Clay Bowl Giving Project is a fun event for the whole family. Entering it’s 18th year, Clay Bowl Giving Project is a celebration of local artists that supports survivors of domestic violence. It is an amazing outpouring of creativity, concern and compassion for survivors of domestic violence and their families. Local potters donate hundreds of unique, handmade bowls for Clay Bowl attendees to take home. Choose from lunch or dinner, but before you sit down to eat, be sure to browse the selection of beautiful, glazed clay bowls. Some faithful attendees prefer to amass a collection of bowls made by a particular artists, while others prefer to get something new each year. Whichever path you choose, you will be sure to find something that sparks joy. 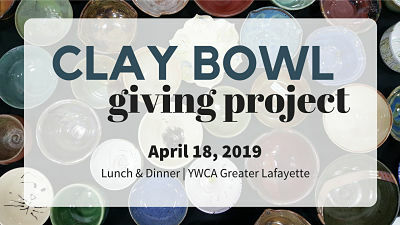 Proceeds from Clay Bowl Giving Project provide safety, hope, and healing to victims of domestic violence through YWCA Greater Lafayette’s Domestic Violence Intervention and Prevention Program (DVIPP). In 2018, YWCA Domestic Violence Intervention provided 9,031 nights of safe shelter to 484 survivors of domestic violence, including dependent children. YWCA legal advocates assisted with 446 protective orders during that same year. Without events like Clay Bowl Giving Project, we would not be able to do the work we do. Register online or call 765-742-0075 to register by phone.